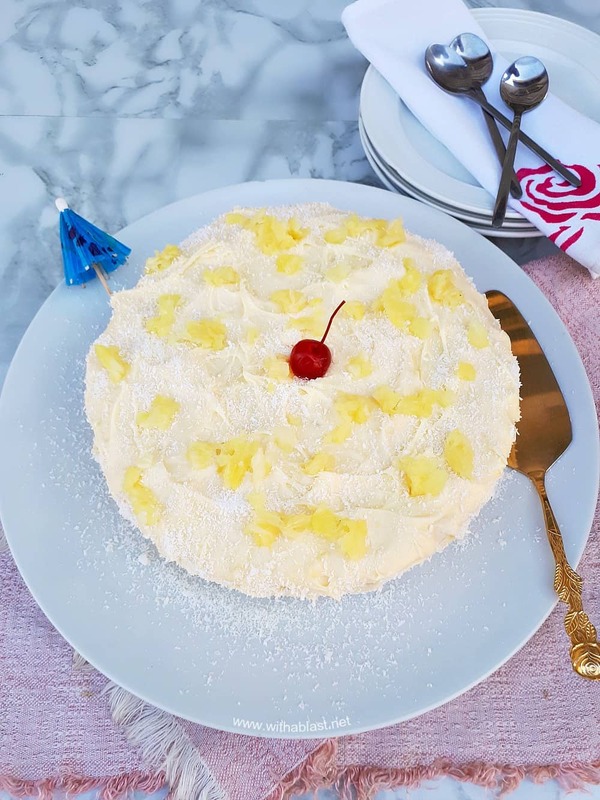 Pina Colada Cake is so soft and moist with an equally delicious frosting – filled with the flavors of the tropical cocktail which just screams Summer ! My addiction to coconut is now really getting out of hand, it seems every second or third post is coconut related – sweet and savory. It’s just so TROPICAL ! 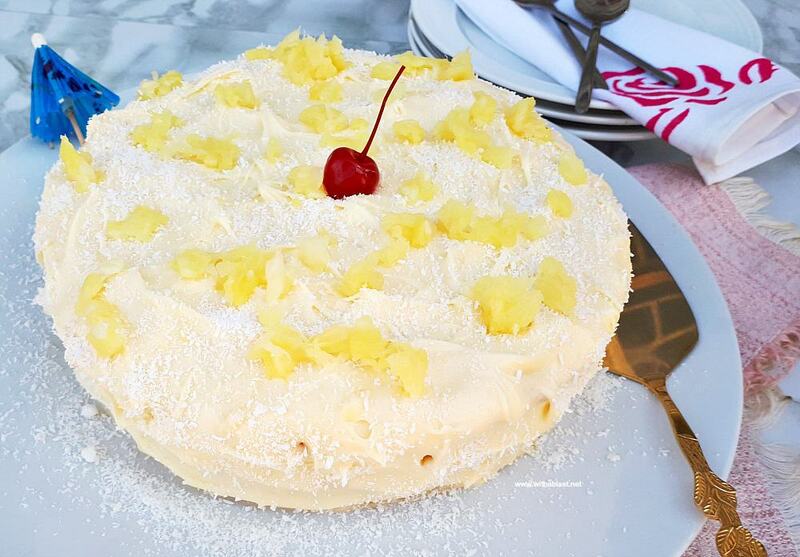 Pair it up with Pineapple and you have a winner like this Pina Colada Cake. In general anything Pina Colada makes you think of Summer, the beach or even lazying around your swimming pool. 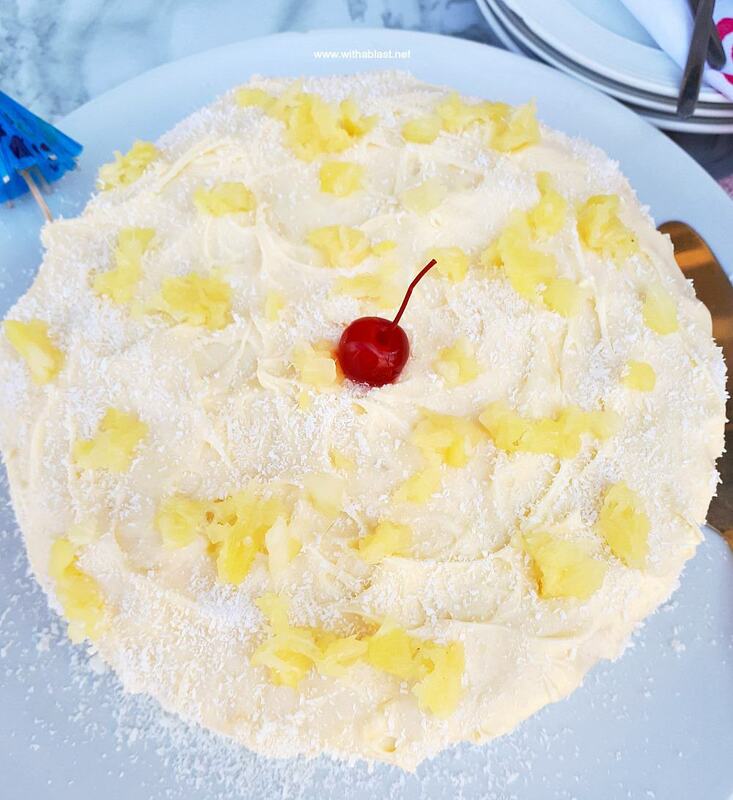 Although, to my own humble opinion, cake should be served with a cup of tea or coffee, you might as well enjoy a Pina Colada Cocktail with the cake ! 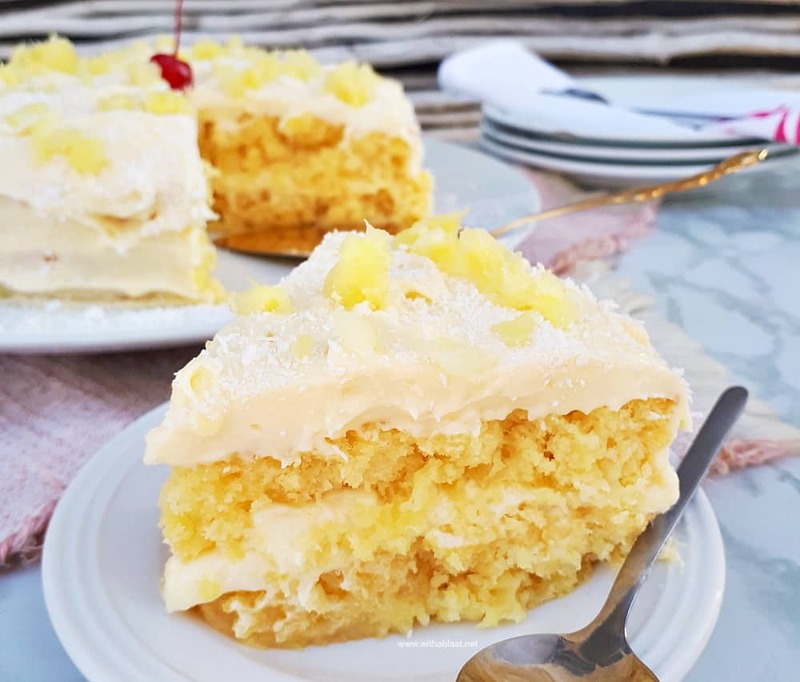 This cake is very moist as Crushed Pineapple (undrained) is added to the batter – be careful when removing from pans .. I almost broke mine! Not sure which part I like most, the cake or the frosting ! Both are so decadent, but I can really eat the Cream Cheese Frosting with a spoon. 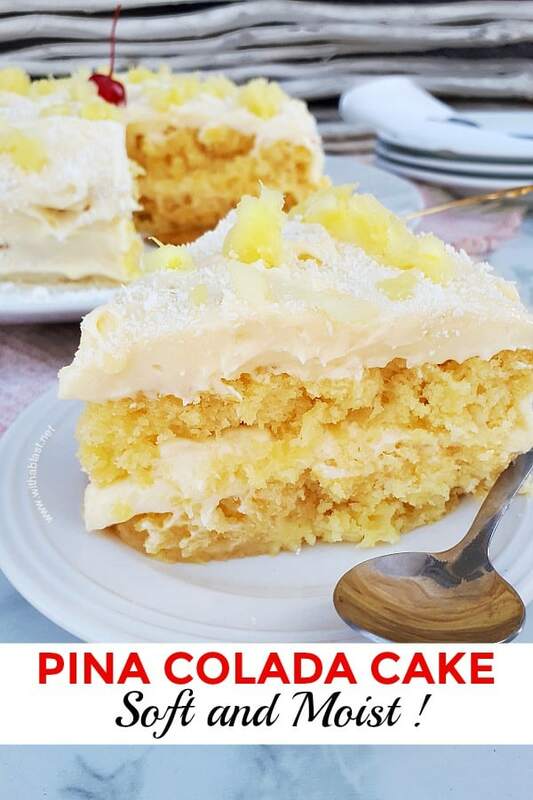 Pina Colada Cake is so soft and moist with an equally delicious frosting - filled with the flavors of the tropical cocktail which just screams Summer ! Yum– that looks REALLY good! That looks so good. I'm a huge coconut fan also. Will definitely have to try this. Pinned ….. I can't wait to try this one, Linda! Oh Yum! This looks so good and FRESH! So happy you are joining us for the Get Your Chef On Cooking Challenge!! Can't wait to see what you make!! That looks so great! I'm suddenly hungry. My two favorite things coconut and pineapple! Looks yummy. Thanks for sharing. YUM! I love pina colada anthing! This cake looks delicious. Thanks for sharing at Creative Thursday. This sounds really good and you made it from scratch! 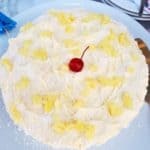 Just today we made a pina colada cake the easy way! LOL! We just added coconut milk instead of water in the boxed mix an then made it like pineapple upside down cake. Yours sounds like the real deal though! This looks so good! Thanks for linking up! This sounds and looks great. Thanks for sharing at the All Star Block Party. OK I so wish there was not a whole ocean between us. I would be at your house everyday with my fork, Lol. Thank you for sharing at Freedom Fridays. This looks so good. Perfect for bringing the tropics to the table. Thanks so much for sharing on Tout It Tuesday! Hope to see you tomorrow. 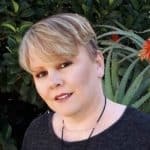 Hi, Jessica – I'd be honored to be featured as your up-and-coming blog ! Thank you for thinking of my VERY new blog. Awesome! I will write a post about your blog next week for Wednesday and let you know when it's up!! !